Berlin, 22 February 2013 – In Berlin the feeling of trust among its citizens in daily interaction is very pronounced in comparison with other metropolises worldwide. In contrast, it is rather mistrust of the political elite that prevails in the capital city. 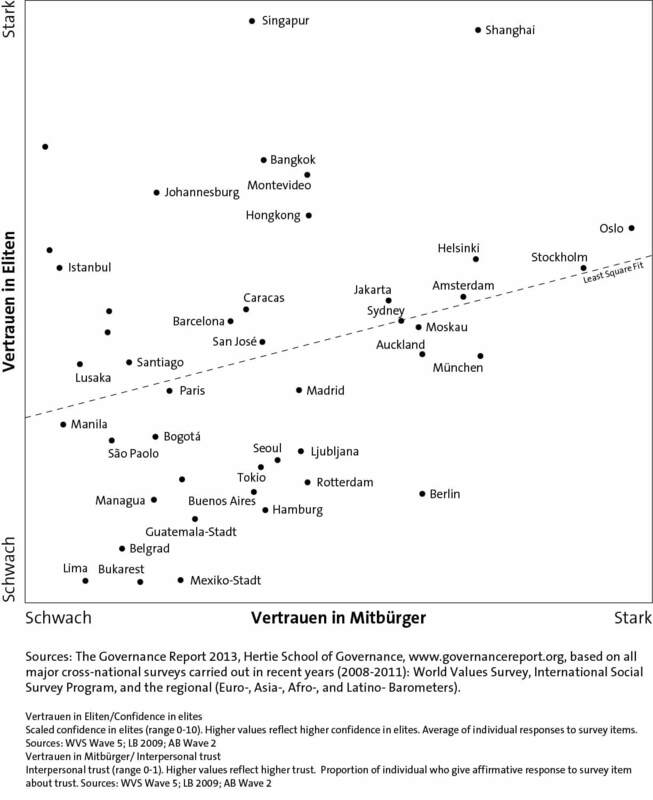 This is an outcome of the metropolis comparison that the Hertie School of Governance demonstrated today at the launch of their “Governance Report 2013”. In the Report, around 70 big cities worldwide were compared with each other in four categories: quality of the institutions, public good provision, trust and corruption. Data from a plurality of official and scholarly sources as well as broad interdisciplinary opinion surveys from the time period 2008 – 2011 were entered into the new Indicator System. Evident at first sight is the positive assessment of fellow citizens in Berlin: only in the Scandinavian metropolises of Oslo and Stockholm do the citizens have a clear higher trust in daily interaction, not to be taken in or to be let down by someone – for example when shopping and in general contact with fellow citizens. 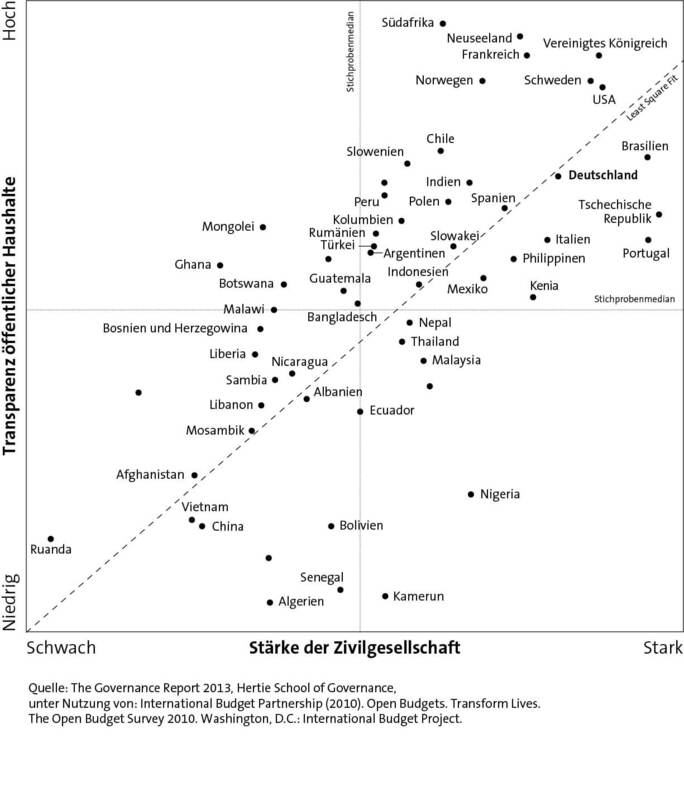 In Munich interdependent trust is also very high. In contrast, in hardly any of the compared cities is the trust in the political elite as low as it is in Berlin. Whether Amsterdam, Munich, Paris, Stockholm, Sydney or Tokyo – municipal political leaders enjoy more trust everywhere than in the German capital. Two further outcomes of the data comparison stand out: In Berlin, income plays a very small role in personal happiness, which is rarely the case in other metropolises. And – perhaps even more surprising: the Berliner does not feel like a world citizen. To the question of whether they not only feel at home in their city, but also in the whole world, a comparatively small fraction of Berliners answered with yes. These are the first results of the new Indicator System that Prof. Mark Kayser, PhD, and Dr. Piero Stanig of the Hertie School build upon within the framework of the Governance Report. Further information is continually being collected. The goal is to be able to better reconstruct developments that have been equally influenced by cross-sharing relationships on transnational, national and city levels as well as through nations, corporations and non-governmental organisations. Through this the Hertie School aims to deliver politically relevant and practical data for the implementation of ”Good Governance“ measures. In this regard, the metropolis comparison is of particular value, as developments in big cities are often an indicator for global trends. “The Governance Report 2013“, edited by the Hertie School of Governance with a foreword by former federal president of Germany Prof. Dr. Horst Köhler, is available from the Oxford University Press as well as in book shops. The accompanying volume, “Governance Challenges and Innovations: Financial and Fiscal Governance” with extensive contributions on all themes of the Report will appear in August 2013.